We welcome pets at our pet-friendly hotel in Groveland, CA. At Hotel Charlotte, we understand how important it is for you to bring your four-legged companion along; after all, Groveland has many pet-friendly activities, including select paved trails in Yosemite National Park. We offer pet-friendly lodging for guests here at Hotel Charlotte in Rooms 7, 8, and 15. Please read our pet policy to learn about having your pet stay with you. 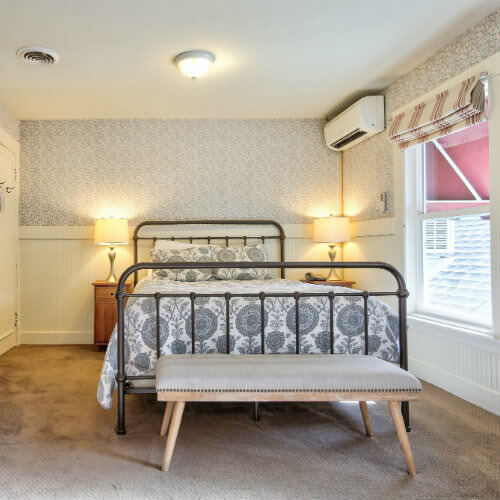 Room 7 is our newly renovated room with beautiful walnut wood floors and charming décor, and is one of our larger rooms with a King-sized bed and Queen futon and private bathroom with a shower. 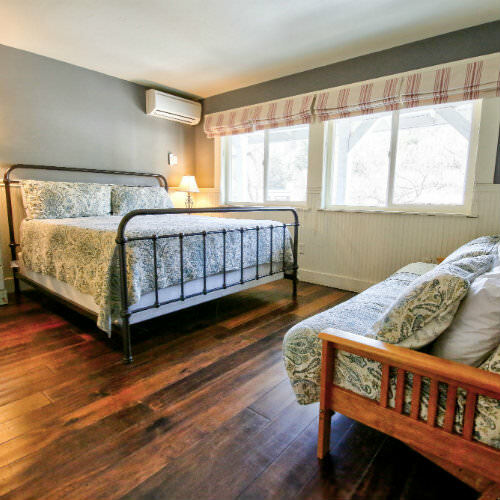 This pet-friendly accommodation at our Groveland hotel near California’s Yosemite National Park is located on the first floor so it might not be a good choice for light sleepers or late risers. 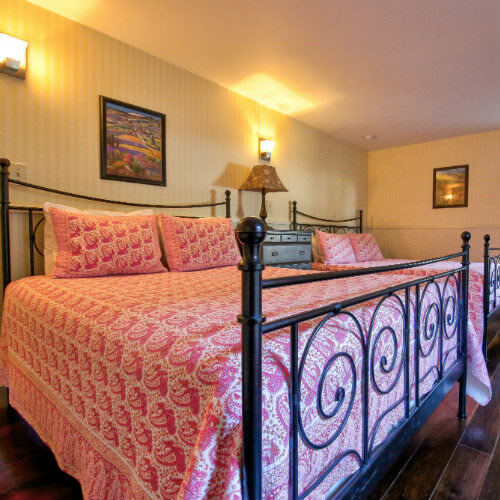 Rate is based on 2 person occupancy, additional guests over 2-years old are $20 per night. 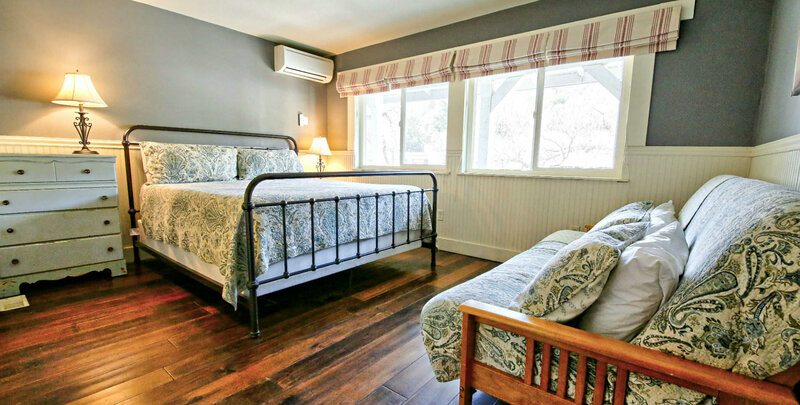 Room 8 is the largest room at our Groveland hotel at Yosemite National Park with two Queen-sized beds and if you add a rollaway bed it can accommodate up to five people. This spacious accommodation includes a private bathroom with clawfoot tub. Rate is based on 2 person occupancy, additional guests over 2-years old are $20 per night. Located on the first floor, next to the hotel lobby and dining room, it is not a good choice for light sleepers or late risers. This stately room is a pet-friendly accommodation at Hotel Charlotte. Room 15 is one of our larger rooms at Hotel Charlotte with a Queen-sized bed, bamboo floors, and a private bath with a newly renovated large spa tub with shower. This airy room feels modern with its upgrades but blends in classic Gold Rush Era accents and colors as a nod to its historic nature among hotels in Groveland, California. Located on the first floor, it is not a good choice for light sleepers or late risers but is a good choice if you’re traveling with a four-legged companion as it’s one of our pet-friendly rooms. If choosing Room 15 with three people, a rollaway will be added (guests over the age of two incur a $20/night fee).